Funding (EPSRC): £1.8 million. 2012 to 2016.
eViz (Energy Visualisation for Carbon Reduction) is funded by a £1.8 million grant from the EPSRC which aims to show people where energy is being is lost in the home and how different behaviours impact upon energy usage. The project is being co-led by Plymouth University researchers Pieter de Wilde, from the Environmental Building Group, and Sabine Pahl, from the School of Psychology, along with academic partners in Bath, Birmingham and Newcastle Universities. The project offers an opportunity to bridge the gap between those developing and building carbon efficient technologies and the people using them. Most people living in the UK today would agree with the need to reduce their carbon footprint and many make an effort to do so through recycling their rubbish, installing low energy light bulbs, or even improving their home insulation. Despite this, the UK recently experienced its first rise in carbon emissions for almost a decade, driven in part by domestic energy use over the unusually cold winter. How has this come about? According to Dr Sabine Pahl, of the Psychology and Sustainability Research group at Plymouth University, one reason may be that the impact of an individual’s behaviour on energy usage (e.g. leaving curtains or internal doors open) is often dramatically underestimated, both by the person and experts assessing and building carbon-efficient technology and houses. This is where a new research project, eViz, hopes to make a difference. The general idea of the project is to literally visualise energy in a dynamic way so that people can get a handle on where and how a building is losing heat. 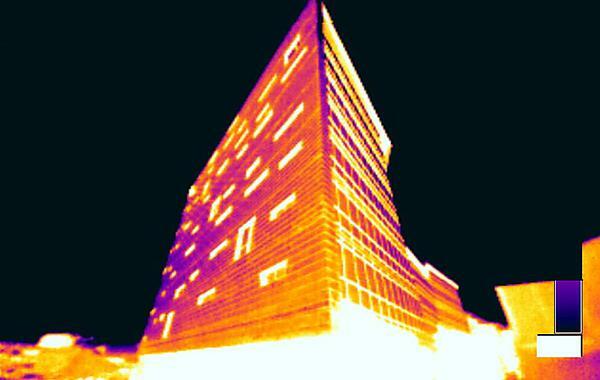 Previously, we have found that static thermal images allowed people to get an idea of the heat loss from their homes and this encouraged more sustainable behaviours. In eViz, we will use a variety of visualisation and simulation techniques to map the dynamics of energy flow around a building, over time, and link it in with particular behaviours and actions. For example simulations may show the impact of opening a window in a house when the central heating is on or the benefits of insulation. The results of these simulations will be fed back to the technical partners who are involved with the project (Plymouth City Council, The Energy Saving Trust and The Eden Project amongst others) allowing them to better understand how energy is actually used and how to improve communicating the benefits of energy efficiency to the general public. “People may not want apps for everything or they may find some apps hard to use. However, that is the main aim of the project: to find out which visualisations work best and what’s most intuitive for people to use and understand”. Hopefully the three per cent rise in UK carbon emissions is only a blip in an otherwise downward trend in carbon-usage. However, as we’re faced with another potentially grey summer, coupled with ever-increasing home energy bills, understanding how to stay warm whilst minimising the cost to both the planet and our pockets seems more important than ever.